Paris born, with a strong European appreciation for fashion and style, Maria began creating hats for high end boutiques in Canada and the U.S. in the early 1990’s. The popularity of her designs led to the opening of her own store, Le Chapeau Rouge, in Calgary in 1990. She shifted her attention to wholesale in the late 1990’s, providing hats to over 15 stores across Canada and the U.S. Maria is a graduate of Interior Design from Mount Royal University as well as a graduate of The Alberta College of Art and Design. Her studies have been with Melbourne milliner Louise Macdonald and having sewn most of her life (with a seamstress mother) she had acquired some great skills to accompany her vast designs. As an artist (www.curcicfineart.com ) and designer Maria keeps pushing the envelope in her designs. Some of her hats can be seen on Canadian Television show CBC’s Frankie Drake Mysteries season one. 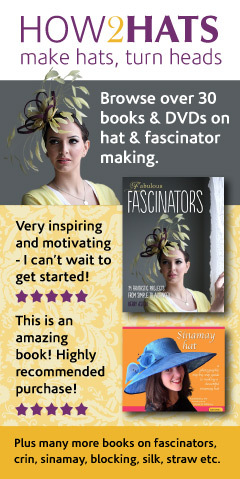 Fascinator workshops – Learn the basics of how to make simple fascinator. Some classes will vary from simple free form felting as well as freeform designing with Sinamay and other materials. See website blog for more info. Classes run 3 hours with materials supplied. For more information please contact Maria in Colwood BC,Canada. 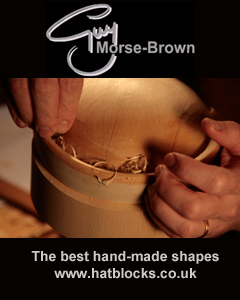 Check out Guy Morse-Brown's block of the month!